"Enlil! his authority is far-reaching; his word is sublime and holy. His decisions are unalterable; he decides fate forever! His eyes scrutinize the entire world!" A prayer to the god Enlil. "Do not return evil to the man who disputes with you, requite with kindness your evil-doer, maintain justice to your enemy... Let not your heart be induced to do evil... Give food to eat, beer to drink, the one begging for alms honor, clothe; in this a man's god takes pleasure, it is pleasing to Shamash, who will repay him with favour. Be helpful, do good"
Incantation from the Šurpu series. 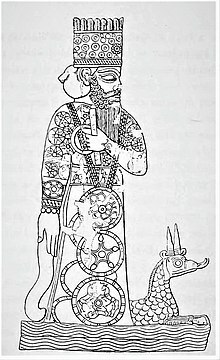 Wikimedia Commons has media related to Mythology of Mesopotamia.